Best of all, the yummy chews are made right here in the USA without potatoes, grains, corn or soy, plus absolutely no artificial flavors, colors, or preservatives. So, go ahead! Let your cutest family member greet your house guests this season. With Fresh Kisses, you've got freshness on your side. 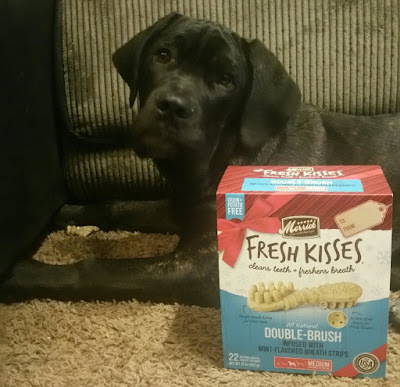 Dog treats to helps clean teeth, fight plaque and tartar, plus freshen doggy breath with a unique shape and botanical formula. Formulated with all-natural spearmint oil breath strip pieces to help keep your pal’s breath even fresher. Cooked right here in the USA without including any corn, soy, or artificial flavors, colors, or preservatives. These dental dog treats come in four different sizes: x-small, small, medium, and large! Even though are dogs are very large, we got the medium Fresh Kisses and they were perfect! 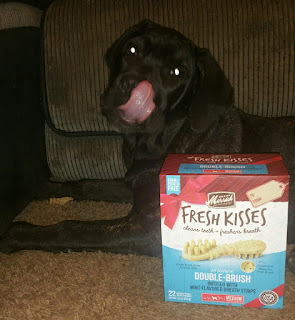 The dogs loved the taste of these long-lasting dog treats and we all loved that ti gave the dogs fresh breath! Did you notice a breath freshness improvement?? Nothing is worse than a doggy who has less than sparkling-fresh breath! This sounds great!